Summary: Chordomas are locally aggressive malignant tumors of notochordal origin whose metastatic potential is increasingly recognized. Surgical pathway recurrence has been noted only rarely in the literature. We present three patients with clival chordomas whose sole or initial recurrence was along the pathway of prior surgical access. A characteristic mass found along the pathway of prior surgical access for resection of a chordoma should suggest recurrent chordoma. Chordomas are locally aggressive tumors of notochordal origin (1, 2). Sites of origin include the sacrococcygeal region, clivus, and vertebral column. After treatment, which typically includes both surgery and radiation therapy, tumors may recur locally (at the primary site) or may form nodal or distant metastases. Although local recurrence is the predominant form of treatment failure (3), the metastatic potential of chordomas has been increasingly recognized, with estimates in the literature ranging from 10% to 43% (2, 4–6). The more common sites of metastasis include lung, lymph nodes, skin, liver, and bone. Another mechanism of treatment failure is recurrence along the surgical pathway (3, 7). Among the approximately 70 patients with chordoma who were treated and followed up at our institution between 1988 and 1998, we report three in whom recurrent disease developed along the surgical pathway. Our purpose is to call attention to this unusual form of treatment failure and to illustrate that a distinctive mass lesion arising along the surgical pathway in a patient with a history of chordoma is likely to represent this less well-recognized form of treatment failure and should be histologically confirmed and appropriately treated. A 47-year-old man noted diplopia in November 1992. An MR imaging study at that time revealed a 6-cm mass at the skull base that was markedly hyperintense on T2-weighted images and enhanced after administration of contrast material. A large clival chordoma was resected 4 months later via a right trans-sphenoethmoidal approach with accompanying medial maxillectomy. A gross total resection was achieved, but microscopically positive margins at the cavernous sinuses were present bilaterally. Postoperatively, 70 Gy of proton beam radiation was delivered to the clival region during the course of 8 weeks. In December 1996, the patient noticed a subcutaneous mass along the right bridge of the nose at his incision site, a site that was entirely excluded from the previous radiation field. An MR study obtained 1 month later showed no evidence of clival disease progression, but did show a 4-mm mass involving the right bridge of the nose, separated from the central skull base lesion by more than 4 cm of normal tissue (Fig 1A). The lesion was hyperintense on T2-weighted images and enhanced intensely after contrast administration. The mass was followed up clinically and by imaging, as it was thought perhaps to represent scar tissue or a foreign body granuloma; however, it progressively enlarged (Fig 1B and C). The patient returned to our institution in April 1998, at which time a 3 × 2.5-cm nontender mass was noted at the right bridge of the nose, extending from the superior orbital rim to just above the ala, not involving the medial canthus (Fig 1D and E). Review of the outside serial MR images showed a progressively enlarging mass with persistent T2 hyperintensity and contrast enhancement. Resection was performed via a right external ethmoidectomy and medial orbitotomy, and 10 Gy of intraoperative radiation therapy was administered. Pathologic examination showed chordoma, with negative surgical margins. Case 1: MR findings in a 47-year-old man with clival chordoma. A, Axial T2-weighted image (2500/80/1) shows a small, well-circumscribed, hyperintense nodule along the right side of the nose (arrow). B, Axial T2-weighted image 6 months later shows interval enlargement of the mass involving the skin and subcutaneous tissues. C, Contrast-enhanced axial T1-weighted image (600/13/2) shows intense enhancement of the mass. D and E, Axial T2-weighted images 2 years later show progressive enlargement of the increasingly heterogeneous, lobulated, soft-tissue mass. At surgery, histopathologic findings were consistent with chordoma. Postoperatively, the patient received an additional 50 Gy of external beam radiation therapy to the involved area along the nasal bridge over the course of 6 weeks, and he has remained without tumor in this area. Within the past year, however, a new left sixth nerve palsy developed, and serial MR examinations showed a progressive increase in soft tissue in the left cavernous sinus, suggestive of progression at the primary site. Gamma knife radiosurgery to this area was performed in April 1999. Currently, the patient is clinically stable, without improvement of the sixth nerve palsy. In 1991, a 47-year-old man was found to have a clival chordoma for which he underwent subtotal resection via a sublabial trans-sphenoidal approach. After surgery, he completed a course of 74 Gy of proton beam radiation therapy to the clivus, which was complicated by unilateral blindness. Two years later, he presented with an anterior nasal mass, which, at biopsy, was found to be consistent with chordoma (Fig 2A). This lesion was separated from the central skull base by at least 6 cm of tissue. The nasal septal mass was resected in May 1993, but by August of that year it had regrown to a larger size (Fig 2B). It was reresected a month later, with the status of these surgical margins uncertain. At the time of presentation with this surgical pathway failure, the patient was stable at the primary site and had no evidence of distant metastases. After the second surgery, he received 49 Gy of external beam radiation therapy to the nose, an area that had been excluded from the prior radiation field. Case 2: MR and CT findings in a 47-year-old man with clival chordoma. A, T2-weighted MR image (2500/80/1) shows a focal hyperintense mass along the right anterior nasal septum (arrow). B, Contrast-enhanced CT scan 4 months later shows recurrence of the septal mass after surgery. It is larger than on the prior examination and is mildly hypodense. C, Contrast-enhanced CT scan 2 years later shows a heterogeneous, mostly hypodense, soft-tissue mass destroying the anterior maxilla and involving the nasal vestibule. D, Postoperative CT scan 4 months later shows evidence of wide resection of the destructive anterior maxillary and nasal cavity mass. Soft tissue density in the left premalar region presumably represents postoperative granulation tissue and scar, as surgical margins were negative. Early recurrence, however, cannot be excluded on the basis of this scan. E, Coronal contrast-enhanced CT scan 8 months later shows a large, lobulated, soft-tissue mass extensively involving the residual left maxilla and premaxillary soft tissues. The lesion shows areas of hypodensity separated by enhancing septa. A fragment of calcific debris is present within the mass (arrow). This lesion was widely resected, and histopathologic examination confirmed chordoma. In late 1995 the patient noted recurrent nasal obstruction and presented to our institution for evaluation. On examination, he had a predominantly submucosal mass extending from the right lateral ala across the midline to just beyond the left ala, as well as a painful bleeding mass involving the skin of the columella and the vestibules bilaterally. A CT study showed considerable destruction of the anterior maxilla by a soft-tissue mass (Fig 2C). A bilateral anterior maxillectomy, a left medial maxillectomy, and a partial rhinectomy were performed. Pathologic examination again showed chordoma, and surgical margins were negative. Three months later, a baseline CT scan was unremarkable except for presumed postoperative changes (Fig 2D); but 7 months after that, the patient noted some cheek swelling, and a repeat CT scan showed an irregular mass centered on the alveolar ridge just anterior to the remaining maxillary molar and extending anteriorly (Fig 2E). Some fragments of bony debris were present in the soft-tissue mass. A left inferior maxillectomy and ethmoidectomy, a right premaxillary buccal soft-tissue resection, and a septectomy were performed in November 1996; in addition, 20 Gy of intraoperative radiation therapy was given for what was presumed to be an additional episode of local recurrence. Pathologic examination again showed chordoma, with negative surgical margins. The patient has remained stable at the primary site and free of additional surgical pathway or marginal recurrence since that time. 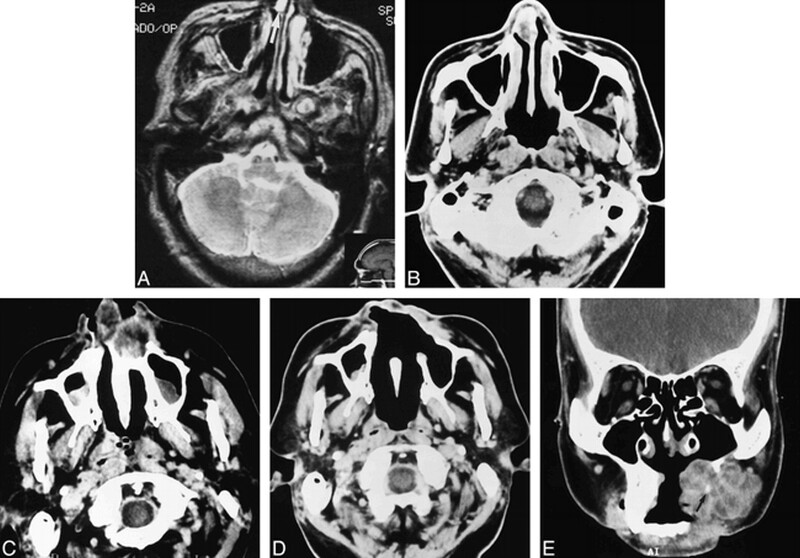 A 33-year-old woman presented with diplopia and occipital headaches in 1986 and underwent an initial subtotal transoral resection of a large clival chordoma followed by proton beam radiation therapy. One year later, locally recurrent disease in the superior clivus was subtotally resected via a trans-sphenoethmoidal approach. In February 1988, she presented to our institution with increasing headache, and an MR study (Fig 3A) showed a mass centered on the clivus that was intermediate in signal intensity on T1-weighted images and hyperintense on T2-weighted images. She underwent left external sphenoethmoidectomy for excision of residual/recurrent chordoma, including dissection of the retropharyngeal/retronasopharyngeal region from the clivus inferior to C2, as well as dissection from the pontine dura. Surgical margins were negative anteriorly but were positive laterally along the cavernous sinuses and posteriorly with the pontine dura. This surgery was followed by additional postoperative proton beam radiation therapy. A follow-up MR examination in October 1990 showed a stable appearance to the clivus but revealed a mass in the anterior ethmoidal region 4 cm anterior to the prior tumor (Fig 3B). The mass was intermediate in signal intensity on T1-weighted images and had high signal intensity on T2-weighted images. In November 1990, the patient underwent a bicoronal frontal craniotomy and a left ethmoidectomy for recurrent chordoma of the left ethmoidal and anterior cranial fossa with dural invasion but without brain invasion. Surgical margins were negative, and non-tumor-involved tissue clearly separated the anterior ethmoidal lesion from the central skull base. The patient was free of disease at both the primary and surgical pathway sites in 1992, but was subsequently lost to follow-up. Case 3: MR findings in a 33-year-old woman with clival chordoma. A, Sagittal T1-weighted image (600/11/3) obtained at initial presentation shows a large soft tissue mass centered on the clivus, consistent with known chordoma. The anterior ethmoidal region is unremarkable. B, Sagittal T1-weighted image 2.5 years later shows abnormal signal in the central skull base, presumably related to postoperative/postradiation change, as it had been stable on several post-therapy imaging studies. In addition, a large soft-tissue mass has developed, centered on the anterior ethmoidal region. Recurrent chordoma was confirmed histopathologically. Chordomas are malignant neoplasms of notochordal origin that typically arise in the sacrococcygeal region, clivus, or vertebral column. The management of chordomas of the base of the skull is particularly challenging as they lie adjacent to vital anatomic structures, such as the carotid and basilar arteries and the brain stem, which limits surgical access and resectability as well as delivery of high doses of radiation (7, 8). Treatment has improved with advances in surgical techniques and the use of proton beam radiation, but a significant number of patients will succumb to local recurrence or distant metastatic disease, with local recurrence representing the predominant form of treatment failure. Once relapse occurs, 5-year survival rates are as low as 5% (3). Recurrences along the surgical pathway are an uncommon form of treatment failure, described in 5% of a large series of patients who had combined surgery and radiation therapy for chordomas of the base of the skull and the cervical spine (3). In that series, surgical pathway recurrences were found in the hard palate, in the nasal cavity, and in a left-sided neck scar. Although surgical pathway recurrence was effectively controlled via salvage surgical resection, other sites of disease later developed in all three of these patients, with the result that two died and the third remained stable at the 4-year follow-up, despite distant metastases. It is important to differentiate surgical pathway from marginal recurrences, as the former may allow for wider repeat resection and greater postsurgical radiation doses, either by external beam or intraoperative routes, or both. Marginal recurrence arises adjacent to the original tumor volume but immediately outside the primary treatment target volume (7). The term surgical pathway recurrence has been used in the radiation oncology literature in reference to chordomas but without a clear definition (3, 7). The term appears to refer to disease along the pathway of surgical access that is not immediately adjacent to the primary tumor or encompassed in the marginal zone. To classify this entity further, we propose that surgical pathway recurrence be defined as that which is located along the path of surgical access and is separated from the primary tumor bed by a significant amount of normal tissue, if there is no demonstrable lymphatic or perineural pathway of spread and if no distant metastases are present at the time of surgical pathway failure. How much normal intervening tissue is “significant?” Obviously, the larger the amount the more convincing that the recurrence is not a local recurrence or marginal failure. A distance of less than 2.5 to 3.0 cm would lead us to suspect a local or marginal failure rather than a surgical pathway failure. The interval from the original surgery might also be a relevant consideration, as most local failures occur within 2 years, but not enough information about the behavior of surgical pathway recurrence is available to define a time limit. The three cases in our series illustrate multiple common factors that we believe permit their classification as surgical pathway recurrence. First, all disease recurred along the route of entry for the original tumor resection. In patient 1, recurrent disease developed at the site of surgical entry through the ethmoidal sinus. In patient 2, recurrent disease developed along the nasal septum, a location that would have been transgressed during the initial trans-sphenoidal surgery. Subsequent recurrences in this patient most likely represented marginal recurrences at this second site, and repeat excisions and additional radiation therapy eventually controlled this patient's disease. In patient 3, an anterior ethmoidal mass developed along the route of access for the definitive surgery for locally recurrent disease. Second, all recurrences were identified at least 4 cm away from the closest margin of resection. Review of the radiation therapy records available in two of our patients confirmed that in neither case was the site of recurrence included in the treatment port. Third, none of the patients had evidence of other local, nodal, or distant failure at the time of diagnosis, and none of the available imaging studies provided evidence of perineural spread of tumor. Fourth, at least a 24-month interval had transpired between combined surgical and radiation therapy and development of the surgical pathway recurrence. Needle track or surgical pathway recurrence is a rare but well-recognized complication of biopsy of a variety of neoplasms. Smith (9) looked at a large series of fine-needle aspiration (FNA) biopsy procedures in the abdomen and calculated the frequency of needle track seeding of neoplasm to be between 0.003% and 0.009%. Seeding after FNA has also been reported from lung and thyroid cancers (10–12) as well as from other sites. In the head and neck, FNA has not been shown to spread cancer along FNA tracks (13). Mighell and High (14) did, however, histologically identify foci of tumor along the FNA track in two of six patients undergoing preoperative FNA with 21-gauge needles. Whether these foci were viable or capable of subsequent growth was, of course, not answerable. It is also possible that transplantation of tumor cells may occur intraoperatively. Cole and Sindelar (15) reported a contralateral iliac crest osteosarcoma recurrence in which the iliac crest had served as a donor site for bone chips. Barloon et al (16) reported frontal lobe implantation of craniopharyngioma after repeated aspirations. Curran et al (17) described nuclear fragments consistent with squamous cell carcinoma in washings from surgical gloves and instruments used during major head and neck cancer surgeries. The significance of this finding as it relates to the possibility of tumor cell implantation is uncertain. In our cases of surgical pathway recurrence of skull base chordoma, we could not distinguish between the two possible mechanisms of either direct implantation of tumor cells at the time of surgical resection or hematogenous spread to tumor to this particular location in which the increased blood flow and concentration of unknown chemotactic factors may have increased the likelihood of tumor implantation and growth at this second site (18). Why tumor recurrence along the surgical approach does not occur more frequently is an interesting question that may relate to both tumor and host factors. Reasons that have been offered include the possibility that implanted tumor cells are physically damaged and nonviable, that tumor cells are nonviable outside the main tumor mass (as no angiogenesis has yet occurred at the new site), and that the body's immune surveillance mechanisms destroy these cells (14). Another possibility is that the radiation therapy that is given to the primary site also adequately covers the surgical pathway in most cases and eradicates scattered implanted cells. In two of our patients (cases 1 and 2) we were able to confirm that the site of surgical pathway recurrence was not included in the initial radiation port; unfortunately, prior radiation records for our third patient could not be located. In the two patients described by Austin et al (7), the primary site received 70 Gy of radiation, the margin received 45 to 50 Gy, and the surgical pathway received 30 Gy or less. In the past, most clival chordomas were approached by transoral and transpalatal routes, with the transgressed tissues typically included in the standard radiation fields. As more highly conformal radiation therapy is done with proton beam or intensity-modulated external beam systems, it is possible that surgical pathway recurrence may become more common. Protons have the advantage of favorable physical characteristics for treating lesions that are located in proximity to vital structures: they have a finite range in tissue and a sharply defined lateral beam edge, as well as a dose distribution superior to that obtainable with photons in certain clinical situations (19). If surgical pathway recurrence does become more common rather than simply being an occasional curiosity, reassessment of treatment planning may be required, with coverage of the surgical pathway as well as the primary site of disease. In addition, radiologists interpreting follow-up examinations in patients with chordomas will have to be aware of the need to include the entire surgical pathway and not just the tumor bed in the imaging field of view so as not to overlook early recurrence that is amenable to salvage surgery and radiation therapy. When the approach has been sublabial trans-septal trans-sphenoidal, then imaging must include the anterior maxilla, nose, and palate. When the approach has been trans-sphenoethmoidal, then imaging must include the paranasal sinuses. In general, treatment planning for radiation therapy of clival chordoma is similar to that for nasopharyngeal cancer, with the exception that the neck is not included in the radiation field. Thus, the anterior and middle ethmoidal air cells and the anterior nasal cavity will receive a significantly lower dose of radiation than the primary site, in part related to the nature of the proton beam and in part related to intentional sparing of the orbit and, by necessity, these adjacent anatomic regions. Furthermore, the anterior maxilla will most likely not be included in the radiation field that is planned for treatment of a clival chordoma (20, 21). Because the surgical approach is generally dictated by considerations of surgical access and exposure, functional preservation, and aesthetics, there is generally little room for modification of technique to attempt to minimize the likelihood of surgical pathway recurrence. If two surgical approaches would be equivalent in these areas, the surgeon might choose to pursue access along the path that will be more fully included in the planned radiation port. Surgical pathway recurrence should be suspected when a mass develops along the pathway of prior surgical access. If the primary lesion has distinctive imaging characteristics and a mass along the surgical pathway has similar imaging characteristics, then one's suspicion of surgical pathway recurrence should certainly be increased. 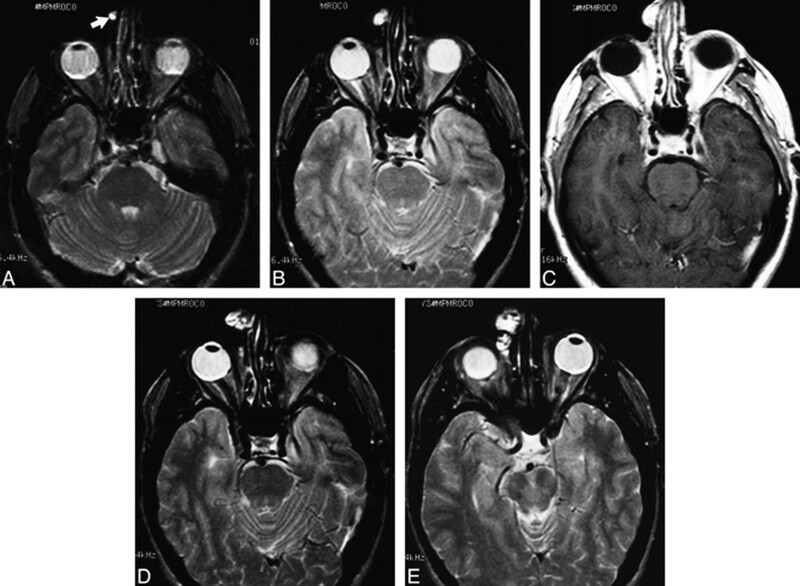 In the case of chordoma, in which the lesion is generally strikingly hyperintense on T2-weighted images, the development of a hyperintense mass along the surgical pathway is compelling evidence of this mechanism. In all our cases, the secondary lesions had imaging appearances identical to the primary lesions. A soft-tissue mass along the surgical pathway could also represent postoperative granulation tissue or a foreign body reaction (eg, to talc or suture material), and in some cases such a mass could be difficult to distinguish from a surgical pathway recurrence of the primary tumor. In the case of chordoma, however, the striking T2 hyperintensity is a helpful feature in suggesting tumor recurrence rather than postoperative changes. In cases in which the imaging characteristics of the primary lesion are more nonspecific, distinguishing recurrence from postoperative changes will be more difficult, and only tissue biopsy will allow accurate diagnosis. ↵1 Presented at the annual meeting of the American Society of Neuroradiology, San Diego, May 1999. ↵2 Address reprint requests to Nancy J. Fischbein, MD, Department of Radiology, University of California, San Francisco, Box 0628, 505 Parnassus Ave, San Francisco, CA 94143.